Valve has published the results of its most recent Steam Hardware & Software Survey, providing some interesting insight into the gear used to play games on the popular digital distribution platform. Diving right in, we see that AMD’s recently released Ryzen line of CPUs hasn’t had much of an impact among Windows gamers. In fact, AMD processor usage has fallen from 21.89 percent in February to just 19.01 percent as of June while Intel’s share has shot up from 78.07 percent to 80.92 percent over the same period of time. In related results, the survey shows that usage of dual-core CPUs running Windows dropped 3.22 percent – from 44.80 percent to 41.58 percent – from May to June. During that same time, adoption of quad-core chips increased 3.38 percent, from 49.21 percent in May to 52.59 percent in June. Nvidia continues to rule the roost as it relates to discrete graphics card usage. The survey reveals that 63.61 percent of GPUs are from Nvidia versus just 20.5 percent from AMD. Intel graphics, meanwhile, are used by 15.54 percent of Steam users – more than I would have guessed. 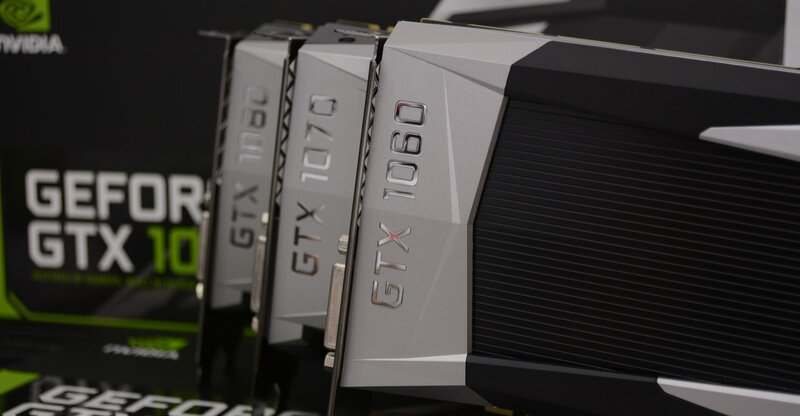 Digging a bit deeper, we find that as of June, the GTX 1060 was the most popular DirectX 12 card among Steam users at 6.29 percent market share followed by the GTX 750 Ti at 5.88 percent and the GTX 960 at 5.75 percent. Gamers are also populating their rigs with more RAM these days. According to the survey, 38.90 percent of systems utilize 8GB of memory which is up 2.77 percent. All other lower capacities have declined in usage, the data shows. Systems with 12GB or more have also increased in share, up 0.96 percent to 23.06 percent overall. Other quick-hit facts: 1,920 x 1,080 is the most popular primary desktop resolution at 48.77 percent share, 61.82 percent of systems have a microphone attached and 1TB or larger hard drives are most common at 35.90 percent. Usage of HTC’s Vive VR headset also outweighs that of the Oculus Rift with HTC enjoying 60.82 percent of the market share. On the software side, it’s no surprise to see that 96.24 percent of users utilize some flavor of Microsoft’s Windows operating system. Apple’s OSX is found on 2.95 percent of machines while Linux’s market share resides at just 0.72 percent. What is noteworthy, however, is that adoption of Windows 10 64-bit has climbed 1.28 percent, now accounting for 50.33 percent of all Windows installs connecting to Steam. Windows 7 64-bit is the second most popular version at 32.05 percent followed by a massive drop-off down to Windows 8.1 64-bit at just 6.86 percent usage.